Have you been looking for an Engagement Ring, but can’t find what you want? Do the rings that you have tried on look nice enough but you are still not sure? You found one that looked really nice but seemed too expensive to justify? 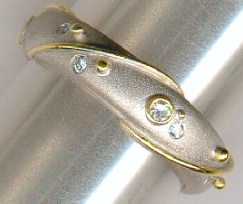 I can make any ring in Yellow Gold, White Gold, Platinum or mixes of those metals to your design. This price will remain unchanged unless you make changes to your design. Please note that if you take a long time to agree the price, that price may alter according to market prices of Gold or Platinum. Can we use a smaller stone? Can we use less metal, does it need to be that thick? Just because you are having your Engagement Ring Hand made it does not have to more expensive than buying from a shop. In fact, most of my past clients will tell you that they saved a lot of money ‘like for like’ on ready made prices, had they been able to buy from a shop the rings that I made for them! It makes more sense for you both to come to an agreement on the whole thing from start to finish! Most of my clients do have to work within a budget and this does not mean we cannot find some way of achieving the end result that you dream of. Should I choose my Wedding Ring when I design my Engagement Ring? You may decide to go for a ready made option when it comes to Wedding Rings, this is not a problem as I have accounts with other manufacturing Jewellers so you can get those from me as well. I have lots of pictures in catalogues to help you choose. I already have a stone, can we use that one? You may have a stone that you would like to use in your ring, that is no problem we can design something around that stone. I don’t have a stone, can you get one for me? I don’t keep a stock of stones but do have access to all stones of quality, colour, clarity and shape and can get one for you if you want me to. These stones come from Hatton Garden and so can be of the best quality according to your budget. You can even choose from a selection of prices and qualities. I would like to go ahead, What do I do now? Give me a call on 01507 463130 or send me an email and we can arrange a no obligation meeting to have a chat about what you have in mind. If you decide to go ahead with a Handmade design I will make a mock up of the design so that we can look at the ‘finished article’ and make any changes to the mock up before I hand make the actual ring. There will be a charge for this, however this will be taken as a deposit towards the final ring and be used towards the cost of that ring. Handmade diamond full eternity ring in Ruthenium Platinum. Set with 16 x 4mm diamonds approximately 24 pts each stone totalling approx 3.84 carats. Why not have your rings hand made for you, to your design, your size, just the way you want them!